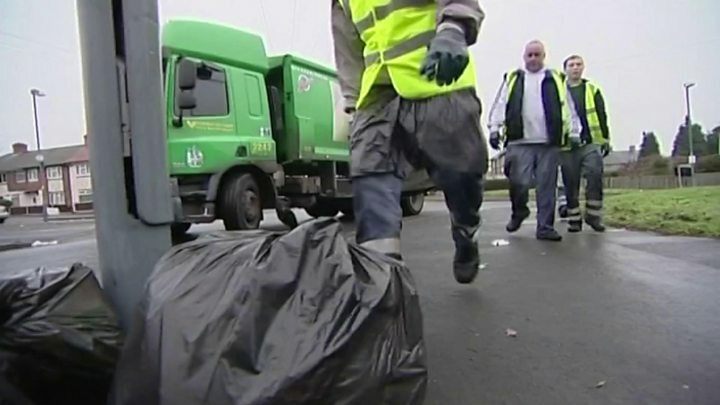 Refuse workers in Birmingham have been on strike in a dispute over job losses. Members of the Unite union stopped work from 10:45 until 15:37 BST on Friday. Further stoppages are also planned. The union claims restructuring plans are threatening the jobs of more than 120 staff. The council, which said plans will modernise the service and save £5m a year, said it is working to address missed waste collections. There will also be a series of two hour stoppages on 3, 11, 19 and 27 July and 4 August. Unite spokesman Steve Foster said: "Nobody wants to go on strike but when nobody's listening to you, the only option is to withdraw your labour." "There's been 100% support for the action that's taken place today," he said. The council said it wants to change shift patterns for the collection crews - from a four day week of nine hours to a five day week of seven hours. Over 100 jobs will be "deleted", it said, but added it anticipated people will be offered new jobs. Agency staff will be replaced by full-time staff. Jacqui Kennedy, for the council, said: "We're asking people to leave their bins out and we will get to them as soon as we possibly can. "We're working closely with the trade unions to try and agree a way forward to address our differences. We do have to modernise the service and that takes some time."